Alkenstar, City of Smog, is a bastion of civilization in the magic-warped region known as the Mana Wastes. Its ingenious citizens survive in the treacherous Spellscar Desert with the help of canny inventions like guns and clockwork automatons, but now their construct protectors have begun to run amok within the city. It falls to the PCs to venture beyond the city walls to find the source of their strange behavior. Will they uncover the mastermind behind the plot and put an end to this madness, or will they instead fall victim to the primal magic and savage tribes of Mana Wastes mutants that beleaguer the city? 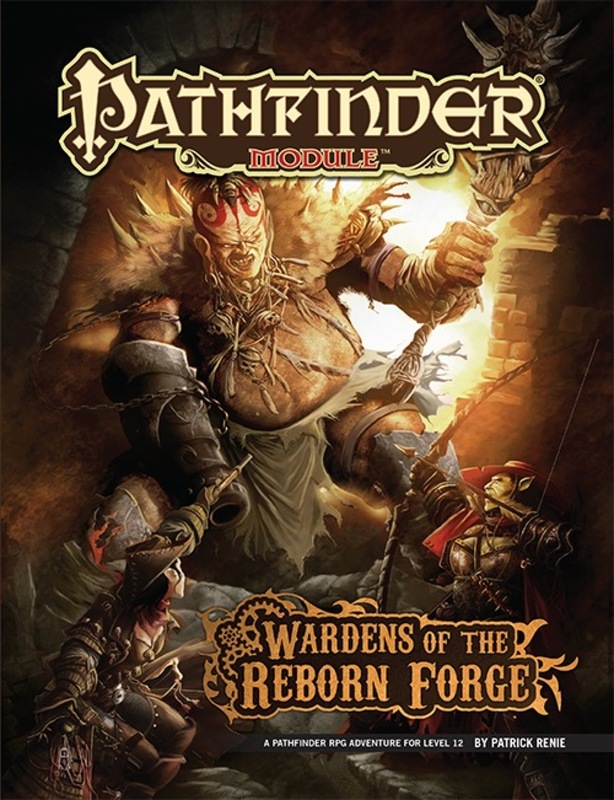 Wardens of the Reborn Forge is a deluxe super-adventure for 12th-level characters, and includes 64 action-packed pages of adventure filled with mechanical machinations, new monsters, a beautiful double-sided and full-color poster map of Alkenstar, and an important miniatures-scale battleground! Players can expect to reach 15th level by the time they complete this epic adventure—if they manage to survive the machinations of the clockwork constructions of the reborn forge! 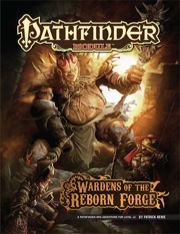 Wardens of the Reborn Forge is sanctioned for use in Pathfinder Society Organized Play. Its Chronicle Sheet and additional rules for running this module are a free download (398 KB zip/PDF). My group loved this adventure. The hazard is real and the fight with the undead is a topic of conversation still, 6 months after we played it. If you want an indication of how the module was written, look no further than the included pull-out map on the print edition. Rather than include any area with machinery, it's a generic flip of a fortress wall, an interior stream, and what amounts to a run-off structure. The module takes place in 3 areas over 4 acts - two of these are generic mines, with 1 sq = 10 ft scaling and constant squiggles. When the mines aren't completely generic, they're kind of fun. There's some nice RP with a few mutants, a couple likable NPCs, an absolutely hilarious encounter that is shoehorned in, and little else. Could have happened anywhere. Act 3 has a primal magic event system with a few claw-out-my-eyes moments, including the need to create elementals that have 4+ templates to reach the likely CRs necessarily for the mana storm. I didn't realize that elementals pretty much stop progressing at CR 11. There are use-activated items of CL 17 and characters who could reasonably be casting at CL 19, meaning custom generation of elementals, up to and including adding templates to Gozreh's herald just to fit a poorly thought out table. It is my hope that the Bard Creature + Fighter Creature + Giant + Advanced Elder Earth Elemental I had to generate (CR 17) comes out and starts attacking with dance moves. Note that Act 3 is not part of the sanctioned content for PFS, unless running the Seeker Arc rules. Act 4 happens in a place that is befitting of the Mana Wastes - a huge factory...just large enough to fall off the edges of a single map. Assuming the final BBEG can act, it can be wonderfully evocative and interesting. This is unlikely, however, based on a number of factors, not least of which is his abysmal initiative modifier. This is the most setting-appropriate section of the adventure, but also the most likely to be derailed, assuming that players did Act 3. It's a grand romp, otherwise, but it really didn't feel very specific to the Mana Wastes. A mutated weird west pathfinder adventure! Of the many pathfinder adventures I have read, this is one that I keep thinking about. The mana storms and dangerous wasteland mutants form a unique and threatening environment that will loom over the characters, while the adventure itself contains fun elements like mine carts, and one of my favorite monsters monsters from H.P. Lovecraft: the gug. What do you call 3 or more gugs? Not a gaggle, but a guggle. This was incredibly fun. The monsters had us in a constant sense of what and why in the dungeon. Stepping back into my GM shoes for a minute, I thought the monster builds were incredibly creative and subverted what the players expected to be playing against. I had a lot of fun. It might not be what we expected but I think that ended up being why we had so much fun. It was a bit of a combat slog, but that I think was in the scope of our expectations. I will admit going into this module with somewhat low expectations (not a fan of pathfinders firearms rules or their take on steampunk) but even then I was underwhelmed. As previous posters have stated it's a long dungeon crawl with low RP, steady combat slog and a somewhat paper thin plot. Now it does have some unique creatures to encounter including my favorite 4-armed creature in significant numbers the tactics and usage of most of the opponents doesn't seem effective for high level play. On the crunch side I was hoping this being the first official module with gunslingers in it would be a good example of how to handle them in a standard game but that was the weakest part of the setup. None of the common gunslinger builds where in evidence and most of the gun using opponents seem to have gone out of their way to avoid the feats/attributes that makes guns dangerous (large sized creatures with dumped Dexterity and no fast reloading or feats to increase fire rate or damage). Overall I have to admit a serious disappointment with this module. I expected better. Now this one sounds cool. Have the details of the map been finalised? (Ie is it the entire mana wastes? A smaller region? A battlemat? Interesting this would definately be worth picking up. I was hoping the second in line for the new module format would be one that started at a higher level, though I admit i didnt think it would start at 12th level. Yay! The Development/Editorial Team doesn't get a lot of time to freelance! Congrats Patrick Renie! This should have a definitive look at Alkenstar as intended by the Developers, since he'll have the resources of the home office to talk to as well. Guns? Steampunk? Dwarves? Clockworks? Why, yes! OK, yeah, I'll pick up my modules subscription again once they go to the 64 page layout. Dragons and then Alkenstar? Hell yeah. They had me at steampunk. I have never ordered this many books from Paizo ever. The last year has been amazing for stellar products. This adventure looks to be absolutely no exception! This is such more interesting then a book about demons, a book about fighting demons, or AP about demons...again. This is where they lost me. Too bad, I've been waiting for years for Paizo to go with a large module format. Maybe next time. Edit: Just saw Dragons Demand - looks like I will pick that one up. Yeah because we've had 0 Pathfinder adventure paths focusing on demons, 0 Pathfinder books on fighting demons, and 1 Pathfinder book detailing the demon lords, their realms, and their mortal worshipers with a wee bit of info on the classic demons and a few new ones. I totally get your annoyance. I personally have near zero interest in this module but it's still very cool that those who do like the region of Alkenstar get a chance to play a game set in that region, and I'll definitely get this module if for no other reason that the stuff I might like. The Dragon's Demand is the first module to use the format. This looks pretty awesome. I love Alkenstar and the Mana Wastes (hopefully there will be more action taking place in the latter, though!). Steampunk type game sounds like a good time to me! Former editorial intern, current developer for Paizo. OMG! Alkenstar!!!! Time for PCs to taste the other side of the bullet? This is completely unexpected and highly appreciated! Easily the most anticipated Pazio book coming up. Number of books on demons = 3 (people can pretend all they want that there is a meaningful difference between devils, demons and daemons... I don't see it) with another coming out. And they are all over the APs like a demonic rash, even more if you're into the Dungeon-days. And Wrath of the Righteous is a demon-tastic AP. Oh, and don't forget the demons in Great Beyond as well. And they're common monsters in AP bestiaries as well: a quick check of pfsrd reveal over 100 demons/devils/daemons/they're-all-the-same-really-anyway. Amazing. This will probably end up being as much of a reference guide to a lot of GMs as it will be a great adventure. I agree they all seem to be the same to me, particularly devils and demons and to a lesser extent daemons. How come all the other evil outsider races are so much more interesting. Well anyway back on subject, I am very happy about this one, maybe the next one will be on another continent, planet or at least numeria. An adventure set in Alkenstar? Yes! Now I just hope we see one set in Numeria. ...and I'm out. I'll be temporarily suspending my module subscription with this one. Now before the flamethrowers come out, for those who have been wanting more Gunslinger & Alkenstar goodness, I'm happy for you. However, unlike past years, 2013 is, for the first time, developing into the year where I'm not trying to get everything Paizo publishes. I decided to stay the course with my AP subscription through Reign of Winter - where I have zero interest in trips to 20th century Earth, and the Worldwound AP - where I'm still on the fence about Mythic (anti-Epic-level play, but intrigued by Mythic). That's an entire year of APs that may be of little interest/use to me but I'm hoping to pilfer stuff I like, I have collected the entire AP run thus far, and I like the AP discount. But that's a lot of money to eat on a "maybe" for content usefulness. In a world where instantaneous travel is possible via teleportation, while I've liked Golarion's "this theme pervades this region" approach, the idea that technology like firearms wouldn't SERIOUSLY alter the setting & warfare seems highly unlikely to me, magic-be-damned. Thus the firearms-Alkenstar thing has always bugged me and quite honestly, I go to Golarion for classic swords-and-sorcery/High Fantasy play, not steampunk. Steampunk typically brings along with it 18th- & 19th-Century Earth tropes or at least window-dressing, and while Golarion is not strictly "medieval" or "Renaissance" in setting, those are the influences most commonly associated with the game, its influences, and the setting to date. And while I want to continue to support Paizo and enjoy all of my subscriptions, it's reached a point where I can't buy products from a collector's standpoint, continue to take a "give it a chance/wait-and-see" or just so fans of "X" get to scratch their itch. So for the fans of gunslingers, firearms in PF, and Alkenstar, I hope that this module is everything you've been patiently waiting for. However, I also hope we don't see more of the same thematic material anytime soon after this one. The evil outsiders all appear distinct to me :/ Each subtype confers unique benefits, and the themes all feel appropriate. This probably isn't the best place to discuss that, but that statement just seemed a bit odd to me. Anyway, definitely interested for this module. Sounds like one that will be a bit difficult for casters to get through. Esctacy of Gold and The Trio are getting played during this adventure. As a Dwarven Gunslinger, I approve. I go to Golarion for classic swords-and-sorcery/High Fantasy play, not steampunk. Steampunk typically brings along with it 18th- & 19th-Century Earth tropes or at least window-dressing, and while Golarion is not strictly "medieval" or "Renaissance" in setting, those are the influences most commonly associated with the game, its influences, and the setting to date. See the way I see it, Paizo's goal with Golarion is to challenge the notion that every setting has to fill into distinct categories like medieval, swords & sorcery, steampunk, gothic, oriental, Lovecraftian, sword & planet, etc. I don't see myself as a Steampunk fan at all, but I am a fan of Alkenstar and firearms in Golarion. I love how the setting blurs these lines, and exposes people to a unique blend of fantasy influences. And the most brilliant thing? If the GM doesn't like it, he doesn't have to include, and doesn't have to buy products like this. It's why I love roleplaying games, and Pathfinder in paticular. That's fairly well reasoned BPorter and presented very well. Number of books on demons = 1. The fact that you don't see a difference between the three major types of fiends doesn't mean it isn't there. Please note that I said Pathfinder adventure paths. While it's certainly true that demons featured rather heavily in Savage Tide and were probably present in the two adventure paths released prior to Savage Tide, so were undead, monstrous humanoids, fey, and all sorts of other monsters. I replied to Dragon78 because of his apparent dislike of anything demonic and annoyance at a perceived flood of demons in the Pathfinder material so far, culminating with the Wrath of the Righteous adventure path. As such, my list of books was there to illustrate that the topic of demons wasn't really that heavily represented in the setting so far. It's there, of course, but fiends are popular foes among gamers. Again, my list featured the books that had already made it into the hands of us gamers, trying to illustrate the point that, so far, Dragon78's perception of some flood of demon-influenced products wasn't based on facts. The Abyss gets 2 pages of text and a map in a 64-page book and that includes a brief and VERY rough description of the types of denizens dwelling there as well as a VERY brief description of some of the notable sites in the Abyss. Wow, the demon presence in that book is insane! So far we've had 3 demons represented in the adventure path bestiaries. The rest are scattered throughout the core Bestiaries and various Campaign Setting books and Modules. And again, daemons, demons, and devils are not the same. They're all evil and they're all outsiders, sure, but that's where the comparison ends. You may pretend they're all the same, of course, and the Badwrongfun Police Department won't come knocking on your door if you treat them as such in your own games. That's entirely up to you. One thing that bothers me about this whole thing is, in all of Pathfinder's history, we've had (once Wrath of the Righteous reaches its conclusion) 1 adventure path and 3 books on demons, and yet some people seem to be under the impression that they're everywhere. Considering the popularity of demons, indeed fiends in general, among gamers, how is that a problem? Of the 3 books on demons (counting the two being released this year), 2 of them function as support material for an adventure path, just like Varisia, Birthplace of Legends and Magnimar, City of Monuments functioned as support material for Shattered Star or People of the North and Irrisen, Land of Eternal Winter functioned as support material for Reign of Winter or Pirates of the Inner Sea and Isles of the Shackles functioned as support material for Skull & Shackles. This is common practice for the adventure paths. Why is that so horrible now that it's about demons? I get that demons don't appeal to everyone, just like the elements featured in Alkenstar don't appeal to everyone. That's cool. I'm just a bit weary of hearing some people groaning "demons? again?" when their presence in the Pathfinder era, up until the Wrath of the Righteous adventure path and its support material, has been rather limited considering their popularity. As for Wardens of the Reborn Forge, I'm hoping that it'll include some more detail on how guns haven't spread beyond that area. That's something that's bugged me for a while now, as it apparently has BPorter. The in-world explanation seems a bit thin to me. To be honest, though, I don't expect it to. After all, a module about Alkenstar will probably be all guns blazing with no holding back on the gunslingers and steampunk elements. When I read the product description, it felt very epic in scope with a lot of roleplaying and some interesting encounters (earhtquakes and riots among them) but with the "dungeon" label there, I have to wonder how much of that will be actual challenges for the heroes and how much of it is "merely" there to set the mood. For instance, will we actually get earthquake encounters and will the heroes actually get to do some major diplomacy to kill the riots? I'm eager to find out, even if the setting itself isn't high on my Like radar at all. You know, I've really had it with monsters now. They really are everywhere, we've come to a point now where you almost can't buy a Pathfinder book without it having more and more monsters. You can pretend they're different, undead, oozes, dragons, or animals, but really they're all the same. Bestiaries are FULL of them, when there really should be more variety. A quick check of the PRD reveals over 1000 dragons/undead/outsiders/they're-all-the-same-really-anyway. I really can't see what people want with all these monsters. And don't get me started on NPCa! Finally! An Alkenstar module! I'd say it's probably safer than having an entire Adventure Path dedicated to it. Also, yay more high level love, assuming it'll go beyond 12 like Dragon's Demand will go up to 7th. Personally, I don't mind the demon tie-ins for the AP since most adventure paths get them. Look at Reign of Winter and the People of the North/Irrisen books. Or the Shattered Star and the slew of more Varisia stuff. Skull & Shackles and the pirate books that followed. Jade Regent and the Dragon Empires books. Of course, certain APs will garner more attention, especially if they are ones that are either based on areas we don't have info about (Jade Reagent), or APs that have been requested a lot (Asian style AP, Demon AP, NUMERIA OMERGHERD!!!1!1!!!). They'd be stupid not to support those APs with their Player Companion and Campaign lines. Besides, I'm getting bored with Varisia. I'm glad to see new stuff on the horizon. Not to say I don't want more Varisia or more traditional fantasy adventures. But I am glad to see some of these other, less traditional stuff get some love too. Finally! An Alkenstar module! I'd say it's probably safer than having an entire Adventure Path dedicated to it. I think that's one of the reasons why Warden of the Reborn Forge is here. To test the waters a bit regarding Alkenstar and the themes represented by the region. It'll be interesting to see if the interest is big enough to warrant future ventures into that region. Dragon78 expresses a preference for this over what he feels is too much demon stuff. Rather than saying that Dragon78 is entitled to his opinion but he disagrees, Heine uses his stick to slap him down. Telling him he has got it wrong because, look: evidence! I show that Heine Stick might want to reconsider his criticism because actually that evidence is subjective (it is only halfway to convincing if you A: ignore pre-PFRPG stuff, B: ignore announced but not yet released stuff and C: are a person who find the difference between devils, demons and daemons to be meaningful). Heine Stick then slaps me down for not accepting his criteria (post-PFRPG, only released stuff, all players must perceive demons, devils and daemons as distinct). Finally, he gets to the good stuff. And then Zaister comes in with a misrepresenting, caricature which uses reductio ad absurdum to criticise my point-of-view. Cheers for that, that's really... y'know... really great and, y'know... thanks... good stuff. We can all like different stuff. We all play the game differently. And we're all entitled to express our relief that we're finally getting something we like when it feels like the latest releases are not our cup of tea. I know Heine Stick and Zaister are cool dudes, they make cool posts all the time. And so does Dragon78. Let's have high-fives and buy each other virtual beers. My round! I've sent you guys a PM. No hard feelings, I hope! To be honest, I can fully understand how you can feel when the release schedule takes a turn to something you don't really like. I'm not a fan of steampunk in mostly standard fantasy, and I've had a year of AP installments that did nothing for me with Carrion Crown and Jade Regent in a row; but I don't feel demons have been overrepresneted in Pathfinder products do far. Yeah I think we have enough demons, devils, daemons. It's sad that there isn't even enough of the other outsiders to have a revisited book for them. I would really like to see a castrovel or akiton model myself and of course numeria would nice too. We will just have to wait and see. Hats off to Patrick for landing this project! The new, expanded format provides an excellent opportunity to do justice to an unusual region of Golarion that likely needs that extra space. This is at the top of my list of upcoming Paizo products.